(New York Times) — HARARE, Zimbabwe — It is an indirect clue at best, but it is often all they can get: Many Zimbabweans have taken to divining the state of their increasingly frail 92-year-old leader’s health from the movements of his presidential plane. On Saturday morning, anyone with a smartphone could see that Air ZimbabweFlight 1, as the plane is known, was hugging Africa’s eastern coast on its way home to Harare, the capital, after four days in Dubai. The flight designation, UM1, meant that President Robert Mugabe, the world’s oldest head of state, was on board. 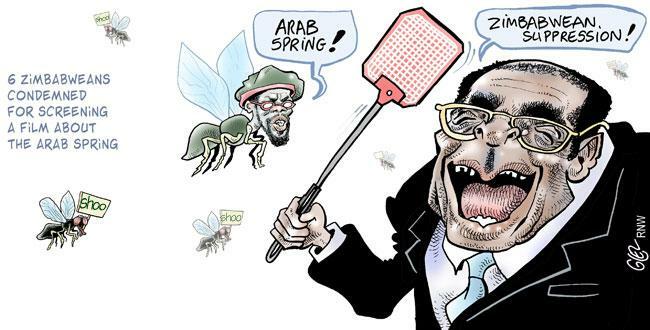 Mr. Mugabe’s trip to the Middle East had been made suddenly, with no explanation from the secretive Zimbabwean government, fueling rumors that the president was deathly ill and desperately seeking medical treatment overseas. But ordinary Zimbabweans and journalists were left with hardly any verifiable facts, other than what flight tracking apps could tell them. And it was not the first time. The uncertainty of a post-Mugabe political order compounds the anxieties. The political class is engulfed in a ferocious fight over succession, and it is far from clear where the security forces, the traditional guarantors of Mr. Mugabe’s power, will stand. In the capital, politicians and diplomats report that Mr. Mugabe has slowed down considerably in the past year. He works only a few hours a day and says little in meetings. Several times, he has been caught on video stumbling or falling asleep at public events. Like most wealthy Zimbabweans, Mr. Mugabe goes abroad for better medical care than he can get at home. That narrows the circle of Zimbabweans who are truly informed about his health — and it means that every time he flies, especially on extended or unannounced trips outside Africa, the rumors fly as well, often claiming that he has died or is at death’s door. This time, the speculation about Mr. Mugabe seemed to have more foundation than usual. He had been scheduled to go to Ghana in mid-August to receive a lifetime achievement award from the Millennium Excellence Foundation for helping to liberate Zimbabwe, but canceled the trip at the last minute. When he resurfaced several days later at an agricultural show, his appearance merely fanned the flames. He seemed to stumble at one point and was apparently wearing slippers rather than shoes with his suit. 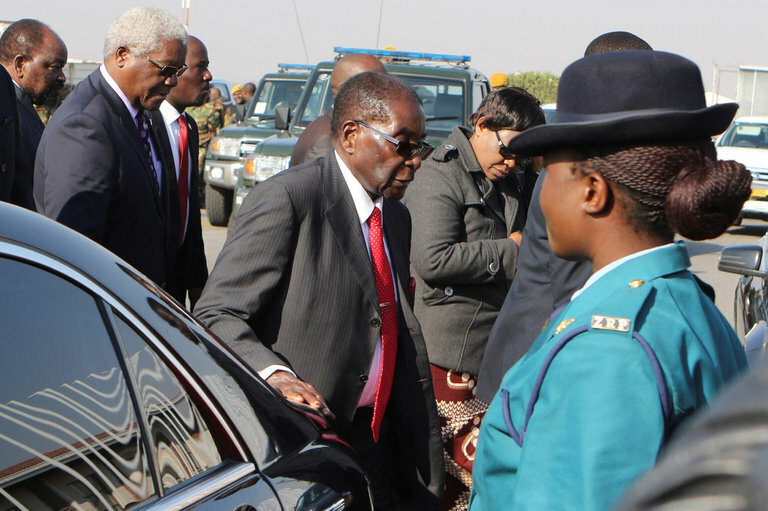 Mr. Mugabe appeared to bounce back, flying to Kenya on Aug. 26 for a conference, followed by a meeting in Swaziland. After that, however, UM1’s movements began raising alarms in some circles. The plane left Swaziland a day before the conference ended, spent three hours in Harare and then took off again for Dubai, arriving on the morning of Aug. 31. “Each time you people don’t know the purpose of the president’s visit, there is always a default explanation that he is ill,” George Charamba, Mr. Mugabe’s spokesman, was quoted in the article as saying. UM1 took off again after midnight on Saturday, and by 6 a.m. the tracking apps had it over the waters between Mozambique and Madagascar, headed southwest. Journalists and officials began to gather at Harare’s airport, where the sun shone in a clear sky on a fine spring morning. When the plane landed at 7:58, reporters for the state news media were ushered onto the tarmac. He said he had gone to Dubai to check up on his elder son, Robert Jr., an architecture student who regularly posts photos of himself partying with beautiful women. Speculation immediately turned to whether Mr. Mugabe’s allies had churned up false rumors of his death to discredit the independent news media and the political opposition. Zimbabwe’s central intelligence organization has a history of spreading disinformation. Mr. Cross, the opposition lawmaker, said by phone that he had based his blog post on information from intelligence officials, members of the governing ZANU-PF party, South African intelligence officials and a minister. Hopewell Chin’ono reported from Harare, and Norimitsu Onishi from Johannesburg.